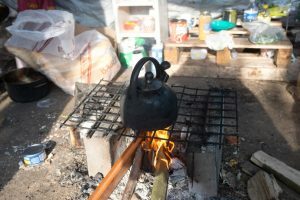 Since April 2017, when the camp at Dunkerque burnt down, there have been refugees camping in the woods and fields in this area. They are mainly either Kurdish or Afghan and include many families with small children. 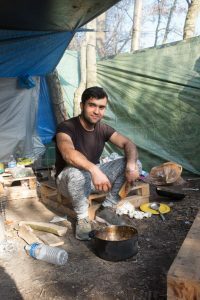 Care4Calais visits sites here twice a week to deliver direct aid, charge mobile phones, bring hot tea, food packs and firewood, and to engage in social activities with the refugees. There have been various initiatives by the French authorities to bus people out to French welcome centres, but despite this people either return or new people arrive, and the problem in Dunkerque continues.